accessible from all over the Modesto area. A vehicle is one the largest investments most people make today. Why would you trust just any shop to do the repairs on your vehicle? At The Auto Shop, we offer full service automotive repair, by certified technicians using the latest diagnostic equipment. Even the most technologically advanced vehicles, receive up-to-date diagnosis and repair. We offer manufacturer recommended maintenance services that are tailored to your vehicle, rather than a ‘one size fits all’ approach like some other shops. We proudly service and repair Asian and Domestic vehicles, including; cars, light trucks and SUVs. We would like you to think of us as “Your Neighborhood Auto Repair Center.” We work by appointment only, to minimize your wait. Call to schedule your appointment today, (209)527-8660. 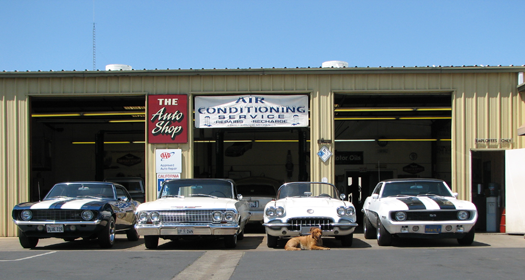 We have been serving the Stanislaus County motoring community since 1977. Our employees and staff build lasting relationships with our clients, and their vehicles. We are very proud to be the auto repair shop of choice, for the children and grandchildren of our long term clients. It is that timeless trust you can depend on from The Auto Shop! “Old fashioned automotive service utilizing today’s technology” … that has been our motto for over 40 years. Give us a call today at (209)527-8660 and experience the difference for yourself! © The Auto Shop (209)527-8660. Proudly powered by CustomerLink Systems. TheAutoShop.biz – All rights reserved.